Successful Small Law firms are usually looking for ways to remain competitive, efficient and productive in managing their operations. The lifeblood of any law firm is its client base. As a lawyer, you can devote a tremendous amount of time and energy to the process of generating prospective clients, converting them into paying clients, and then managing your client relationships, without any clear metrics or system in place to manage this. If you are not analyzing your efforts, you can easily waste time and resources, lose prospects and experience low client retention. Furthermore, it is almost impossible to ensure that you are allocating your resources in the most effective way possible, rather than simply acting on instinct. You need systems and processes in place to streamline operations and real time financial reporting to make informed proactive business decisions. 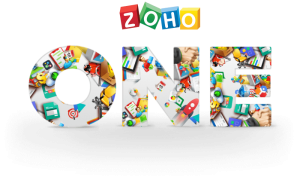 Zoho One gets to the “heart of the matter” with its incredible, integrated, customizable suite of apps to help you do that. Over the next while in our posts, we will showcase the essential “must-have” apps in this amazing suite for the legal profession. Starting with Zoho Books, you can set up simple workflow that help you to work efficiently and collaboratively. A useful list of features and functionality help you get all your important work done in less time. Get everything you need for running an efficient business, but with less effort from Zoho Books. With features like getting snapshot history of your transactions with any contact, real time information made available for multiple users, providing increased accessibility of your clients and multiple organizations in single account; things can only get better at work. Zoho Books organizes and manages all your business transactions in one place. You spend less time invoicing and chasing overdue payments. Online payments offer the advantage and convenience to get paid faster. With Zoho Books, you can easily keep a record of all your estimates, invoices, credit notes, and recurring invoices. Convert estimates to invoices in a click, and use the filter to track invoices which need your attention. Zoho Expense is an expense reporting software that automates recording of expenses from receipts, captures credit card transactions, streamlines expense report approval and provides control over business expenditures. One of the challenges of running a business, is keeping track of the mounting bills & expenses and the money flowing out . This is one of many areas where Zoho Books can help you stay organized. A better organization of your expenses results in an accurate reflection of your spending. Zoho Books helps you break up your expenses into categories, which in turn helps you with tax deductions like car and truck expenses, mileage, etc. If you incur expenses which will be reimbursed by your client, simply add those expenses for the project and include it at the time of billing. Zoho Books gives you the tools to make your time and work count, by providing you with functionality like logging and tracking time, giving role based access to log time, managing multiple projects, and adding expenses related to an invoice easily. We know how easy it is to lose track of time, but as business owner lawyers you cannot afford to do waste this invaluable resource. With Zoho Books you never have to lose a minute of your billable hours. You can either log the amount of time you spent for a project daily or weekly, or use the timer widget to clock the time you spend. It is so important to know and record the whereabouts of your money accurately. With Zoho Books you can update bank accounts and credit card accounts automatically and eliminate data entry. Whether you hold a single or multiple bank accounts, you can organize and manage all banking records in one place easily. Don’t waste your precious time with manual entry of every transaction and reconciling every month, when you can mechanize this process like clockwork. Set up your bank accounts with Zoho Books once and it automatically imports every transaction from your account, which will help you make well informed business decisions right away. What small law firms DO need is to “collaborate externally” with clients whether it’s on their matters or on collecting payments on invoices. The latter is a “do or die” on cash flow. And driving stronger relationships with clients through collaboration tools is a great way to communicate and stay in touch to make them aware of what’s going on with their legal matters. Client Portal allows your clients to keep ​track of all the transactions that have taken place between them and your business. No more lengthy emails, instead collaborate efficiently like never before. No more headaches of compiling and analyzing financial data. Zoho Books provides all relevant data relating to the financial health of your business, in the form of all encompassing reports, insightful dashboard and snapshot information about managing your practice. Now, all you have to do is stay informed, be proactive and take action on those business plans you make. For more detailed reporting and business intelligence capabilities, we’ll introduce you to Zoho Reports (part of the Zoho one suite of apps) in a future blog post. Want to know how your business is faring without going knee deep into data? The Dashboard is the first visual report you see when you log into Zoho Books. 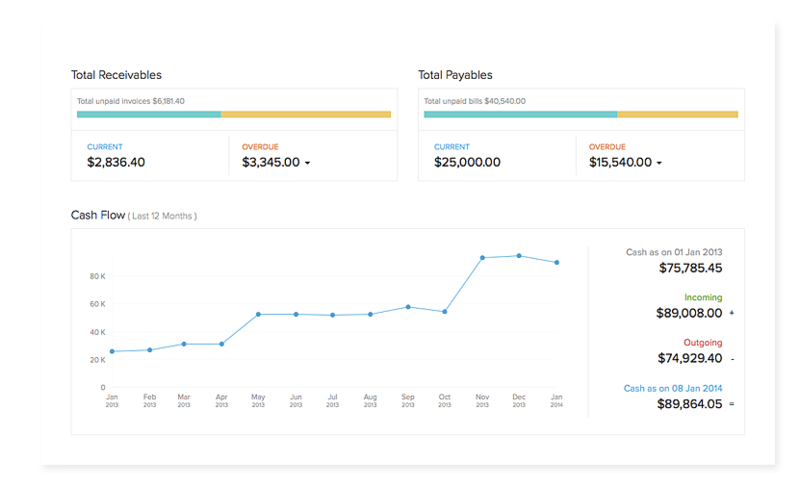 Simply click on the Dashboard of your Zoho Books account and view your invoice Aging Summary, Payables, Income and expense chart, Bank and Credit Card Account Summary and Accounts Watchlist. Each week/day each lawyer can enter their time in Zoho Books.The timesheet module is where you track the time spent working on a case matter for your client. As a lawyer, you earn your income based on the number of hours spent, tasks done for a client matter or a fixed project rate. Using the Timesheet module in Zoho Books you can manage your projects, log the time spent by task by you or other lawyers and raise an invoice for the same. Learn more about Timesheet in Zoho Books. At specified interval (ie , every two weeks or once per month), you run auto-bill in Zoho Books to generate the invoices to send to clients. Usually lawyers have clients’ retainers in trust to apply payments against the outstanding invoices. With Zoho Books you collect an advance payment (or retainer) by first creating a retainer invoice which the client pays before you begin working on a matter. This assures that you’ll have the necessary funds in trust to pay for your legals services when rendered and invoiced. As a lawyer, it is usually imperative that you are able to keep track and report to the your Law society on the status of the clients’ funds held in trust. With Zoho Books, you can generate a report showing a quick summary of the retainer invoices you created, unused retainers and the invoices to which they were applied for a selected date range. The report can be sorted by the status of the retainer invoice. If you bill your clients on time, you get paid on time. Billing clients on time is vital to any law firm. With Zoho Books, you can set up a process to create quotes and send invoices to your clients on time and get paid fast. Generating client invoices from billable time records and accurately billing clients on time ensures that the law firm gets paid in a timely manner. Any small law firms or sole practitioners looking to better organize and manage their practice more efficiently and effectively can achieve meaningful productivity gains and peace of mind by using integrated online technology tools like Zoho Books and Zoho One to do so. Not convinced yet? Contact us for a free customized demo for your legal practice or try the 14 day trial of Zoho Books. We’ll be happy to answer any queries you may have to make Zoho One the only integrated practice management system to run your entire small business law firm.